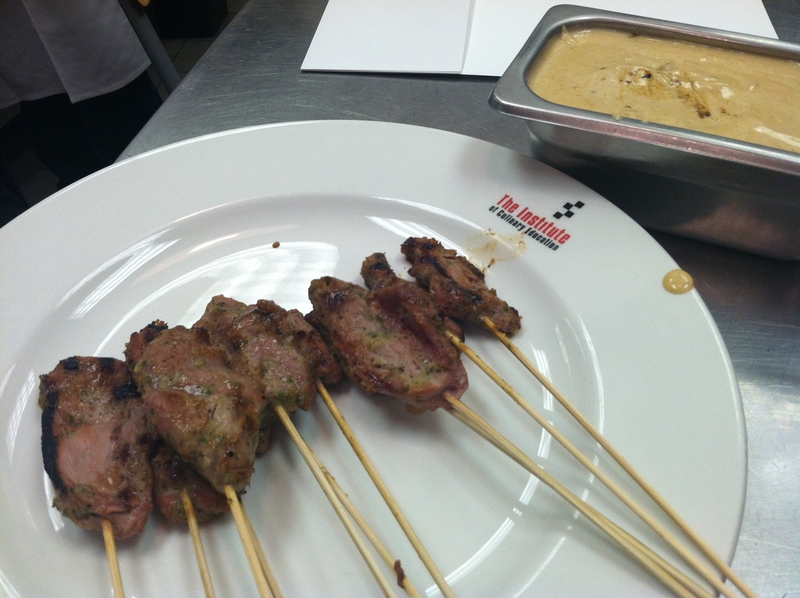 Pork Satay is one of my favorite dishes but I never tried cooking them before. I adapted this recipe for paleo diners, including the dipping sauce. Hope you enjoy as much as we did! Cut pork into strips, about 2 inches long and 1/2 inch wide. Then thread the pork pieces into the wooden skewers, weaving in and out of the meat (think of figure eight patterns), keeping the sharp tips of the skewers insite the meat at the top to prevent them from burning. In a blender, puree the marinade ingredients together. Pour marinade on pork skewers in a large zip-loc bag. Let marinade at room temperature for an hour (or longer if you’re putting in the refrigerator). Heat a grill (or grill pan). We used a grill pan but if you’re using a grill with an open flame, be careful about your wooden skewers burning (try lining the front edge of the grill with a wide strip of double aluminum foil so you can rest the exposed skewers on the foil. Brush grill with oil and then lay the pork skewers on the grill for 5-7 minutes, or until meat sizzles and browns. Turn sticks and grill the other side another 5 minutes, or until cooked but still tender. Place the cashews in a food processor and puree until they turn into cashew butter (about 2-3 minutes). In a small saucepan, heat the oil over medium heat and whisk in the curry paste, honey and coconut milk until smooth and thickened (about 5 minutes). Do not boil it! Remove from heat and let cool and then add the cashew butter. Whisk until smooth. Then add fish sauce and lime juice (add some salt or more honey for taste depending on how sweet/salty you like your dips). Keep warm until use (you can keep this in the fridge for a few weeks! Just reheat before using again). Hope you enjoy this savory combo as much as we did! I found the pork to come out quite juicy and not dreadfully dry which I’m always afraid of with pork. Enjoy! Greetings from Seattle! I’ve been traveling a bit for work but being in this beautiful Pacific Northwest city reminded me of all the fresh seafood available and I had to bring up one of the most simple paleo ideas ever. This might not be the most gourmet of paleo “recipes” but I had to post because it was a game changer for us during the start of football season and hadn’t occurred to me to do at home until recently. When watching the games, we were so used to snacking on everything – or at least we were. But the chips and junk food went away and crudités ended up being our paleo snack of choice. 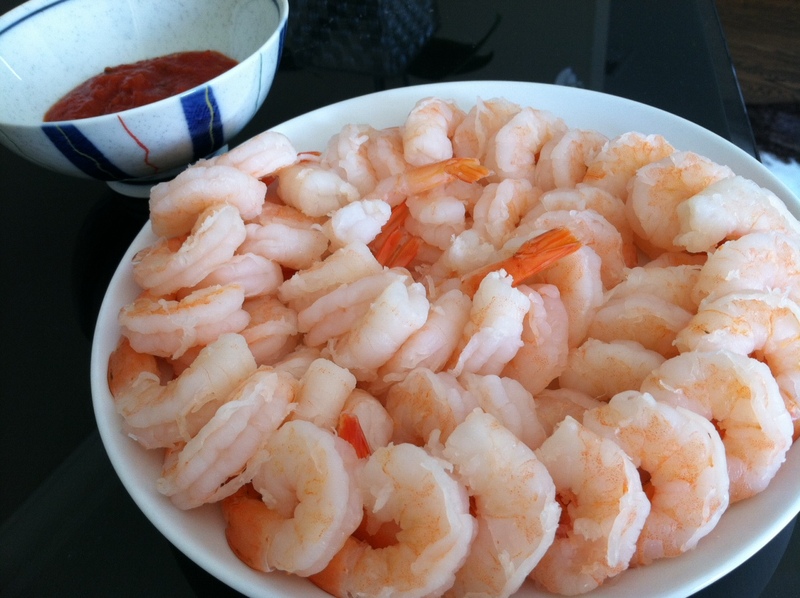 A few weeks ago, my husband asked for something other than fruit and veggies to munch on and a lightbulb went off in my head – I actually forgot how simple and satisfying shrimp cocktail could be. I know, silly me… Try it for your football weekends! Drain and cool. I wish I could say that it was harder but that’s really it. For the dipping sauce, I had some amazing and natural marinara sauce from the local farmers market so I just added some horseradish. Next time I’ll try to be creative and add things to the water to flavor the shrimp slightly.